The Chalet Black Pearl provides an exclusive environment in which the guests savour complete privacy combined with highly professional and personalised services from truly dedicated staff. Spread over 4 levels, this spacious chalet has a swimming pool, steam room and a cinema room and can host 10 people in 5 bedrooms with en-suite bathrooms. 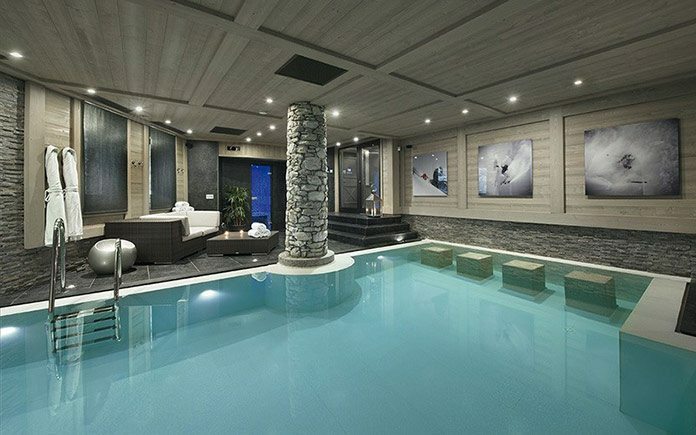 Built by Philippe Capezzone, owner and designer of the the French Palace Hotel Le K2 and 5* Hotel Kilimandjaro in Courchevel 1850, the Chalet Black Pearl was conceived to answer the most demanding criteria in terms of luxury and comfort. 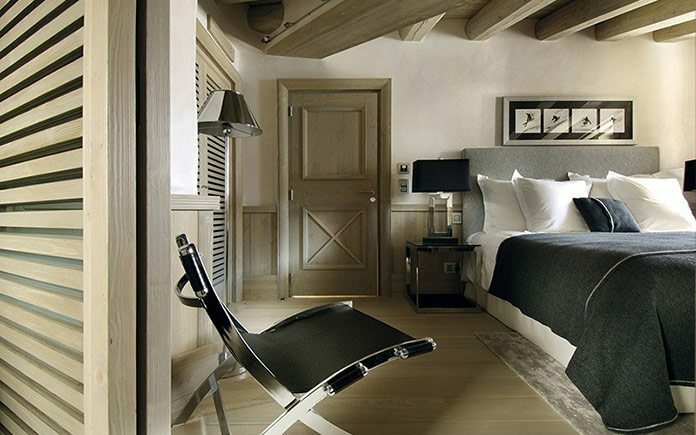 A wonderful mix of contemporary design mingled with traditional Savoyard stone and classic woodwork panelling. Beautifully finished with Andrew Martin materials and furnishings together with many local Savoyard artefacts. Living Room. 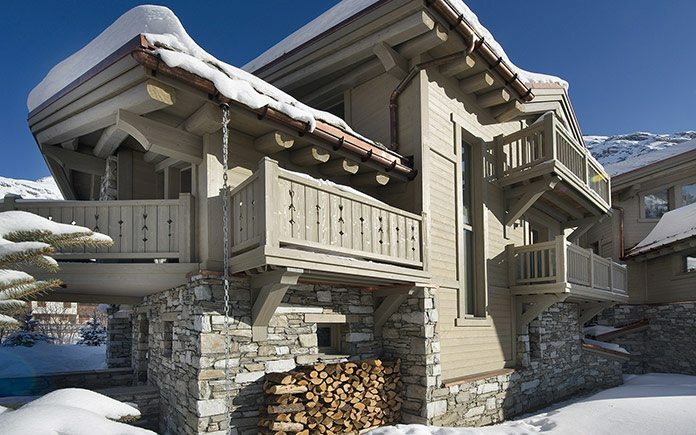 A fine mix of contemporary design mingled with traditional Savoyard stone and wood, creating the perfect atmosphere for guests to gather around the fireplace and relax after an amazing day’s skiing. Culinary Delights. Your private chef is at your disposal proposing a wealth of sweet and savoury delights, creating unforgettable evenings spent in front of a crackling fire with canapes and champagne followed by delicately prepared dishes – a gourmet’s paradise in an intimate atmosphere. Rooms & Bathrooms. All the bedrooms are extremely comfortable with a contemporary yet ‘homely’ feel, designed to turn your nights into precious moments of peace and relaxation. The 5 en-suite bathrooms offer equally stylish facilities. Swimming Pool. When you arrive in the chalet you are immediately drawn to the swimming pool area. With its unusual shape and impressive volume this wellness area will undoubtedly be the place for many happy moments shared with family and friends. The swimming pool has a jetstream and there is also a steam room, cinema screen and zoned relaxation areas. Ski Room. 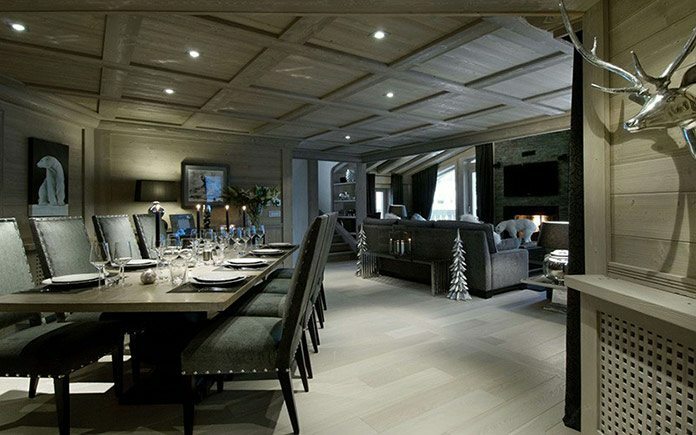 The Chalet Black Pearl created a truly ‘state of the art’ ski room rarely seen in the Alps. 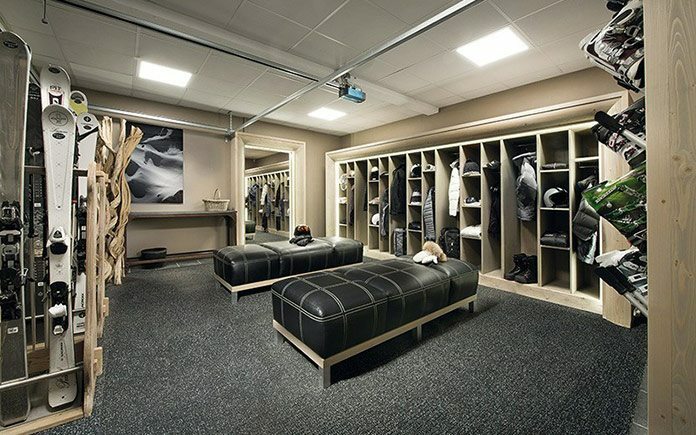 This unusually spacious area has been enhanced by bespoke luxury leather seating combined with hand-made fitted units, all created by local craftsmen. Designed to replicate a professional ski-shop atmosphere, greatly appreciated by all our guests. 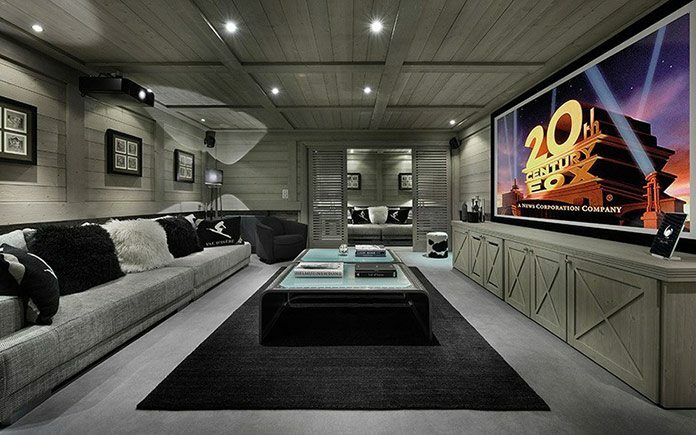 Home Cinema. The home cinema room has a Play Station, a great choice of DVD’s, a multitude of TV channels and, of course, a large movie library with all the latest films available. A great place for both adults and children alike. Depending on availability, Black Pearl’s shuttleis at your disposal every morning to get to the Funival and return in less than a minute (1 shuttle in the morning and 1 shuttle in the afternoon). Equally, The Chalet Black Pearl is perfectly placed to take full advantage of the free bus service which serves the entire resort, with stops just a short distance from the chalet. Of note, Chalet Black Pearl can be rented together with its sister Chalet White Pearl next door to welcome in total 20 guests.